﻿ Linn School - Ohio. Find It Here. 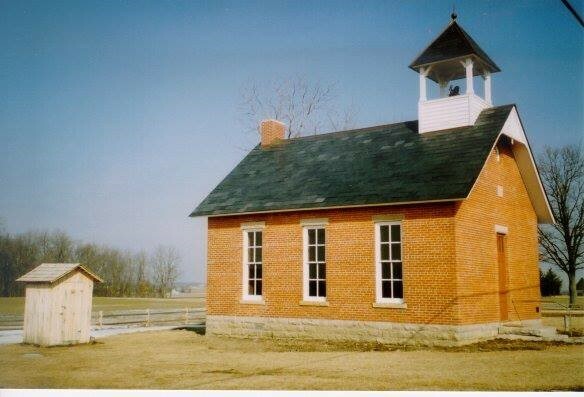 One-room schoolhouses are part of our history and part of our past. These schoolhouses which once totaled 130 in Marion County, Ohio and offered students in rural areas the opportunity to gain an education. Built in 1897 of brick with approximately 800 square feet, this school served students up to the 8th grade. This schoolhouse, Marion Township Sub-District #8, known as Linn School, was not destined for destruction. Instead it was rescued and restored through the partnership of the purchasers and donors, Merle Hamilton (born 9-29-1907), Oliver Hamilton (born 8-24-1903), and the Marion County Historical Society. Oliver attended this school from 1909 to 1914, while Merle attended 1913 to 1920. This historical project not only brought attention to the physical restoration of the schoolhouse, but also to the hearts of the owners. Merle & Oliver purchased the property in 2002, formulated a plan to restore this piece of Marion County history to its pre-1900 condition and donated it to the MCHS the same year. This one-room schoolhouse is a link to our past and will provide an educational experience to those who will tour it through a partnership with the Marion Historical Society and the Marion City Schools.